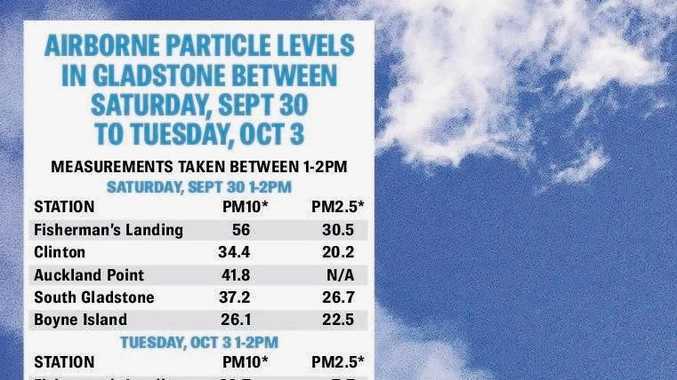 GLADSTONE'S long wait for rain has done wonders for air quality levels, with airborne particle figures dropping by as much as 83% over a two-day period. The Gladstone radar, at Round Hill, didn't record a single drop of rain during September, allowing levels of airborne particles PM10 and PM2.5 to rise. After 36mm of rain fell on Monday and Tuesday the PM10 and PM2.5 levels fell by an average of 65% and 73% respectively at five different air quality measurement stations in the region. PM10 airborne particles refer to airborne particles less than 10 micrometres in diameter, whereas PM2.5 refers to airborne particles less than 2.5 micrometres in diameter. Both particles are capable of penetrating humans' lower airways and cause possible health effects. The Queensland Government Department of Environment and Heritage protection says PM10 particles are generated by a wide range of natural processes and human activities including wind-blown dust, industrial processes, motor vehicle emissions and fires. PM2.5 particles originate mainly from combustion processes such as motor vehicle emissions, industrial boilers, solid fuel heaters and fires. Larger particles tend to settle to the ground in a matter of hours, whereas the smaller particles can stay in the atmosphere for weeks and are mostly removed by precipitation. A Department of Science, IT and Innovation spokesperson said the removal of airborne particles from the atmosphere during rain events occurred by two main mechanisms. "Water builds up on the particle surface, increasing its weight, and it settles out under gravity, or falling rain droplets collide with, and absorb, the particle and transport it to the ground,” the spokesperson said.